During the past two years, traditionally styled bicycles have gained considerable popularity in the US. Fashion models in ad campaigns have been featured riding Gazelle and Jorg & Olif, celebrities have been photographed cruising around on their Electras, and there is over a dozen weblogs now across North America dedicated to cycling and fashion. 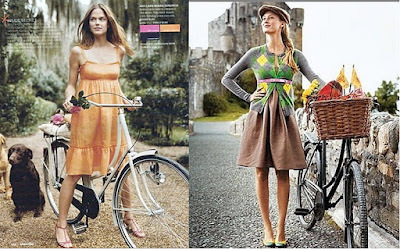 The New York Times made it official by referring to the stylish bicycle as the current must-have fashion accessory. It is hard not to notice that some of the discussions of the “Dutch bicycle craze” come with a degree of scorn. There is an assumption that those who are buying such bicycles are not actually interested in bicycles, but merely want the latest “It” item -- a frivolous, consumerist attitude that is embarrassing to the real, authentic bike lovers. I have gotten this response form several shop owners when I told them what kind of bicycle I was looking for, as well as from some acquaintances who have been riding road bikes for years. Surprised and disappointed to encounter this sentiment, I offer two lines of argument in response. First off, those rolling their eyes at the girls who supposedly must have a Dutch bike as a fashion accessory, may be misunderstanding the situation. If you read the first post on this weblog, I think you will get a pretty good idea of why many women in the US do not ride bikes, and how introducing them to traditionally styled bicycles can change that. When I saw a Gazelle on the street for the first time, I did not know what it was. I had no idea whether it was new or vintage and whether it was considered popular in the public eye. What I did know, was that finally I was seeing a bicycle that I would be willing and able to ride. The point is, that before the Dutch-style bicycles began to be imported in the US, it was simply not possible for fashion-conscious and unathletic women to ride a bike. There were no products for them to buy that would have accommodated their lifestyles. Now there are, so they are buying them. Therefore, to say that they are buying fashion accessories that happen to be bicycles is to misjudge the situation. They are buying these bikes, because finally the kind of bicycles that suit their tastes are available. Second, even if some persons are interested in these bicycles only because they have been deemed a fashion must-have, I do not understand why this should evoke criticism. Is it not the ultimate victory for cycling advocates and environmentalists, that it is suddenly possible to get even the most unlikely suspects interested in commuting by bicycle? Wouldn’t it be an ideological coup for the go-green movement, if all those glamour girls previously driving enormous SUVs now think that cars are totally uncool and anyone who is anyone must have a Dutch bicycle? I can assure you that the majority of the population is far more likely to be influenced by these giggly spokespersons than by the earnest Green activists. It really seems like a win-win situation to me. So please, hard-core cyclists: do think twice about criticizing those who you think want a bicycle “for the wrong reasons”. Consider instead what a fabulous thing it is, that they want a bicycle at all. I love this post!! I've been wanting to write something like this for a while but have been too lazy, and now you've done it better than I could have :) I, too, have noticed the same disdain. Seriously, how awful that people have to look at pretty women ride around the city on pretty bikes. Thank you for your comment Dottie; here's to restoring the Romance of cycling culture! Great article. Cheers to a beautiful bicycle-culture! I am an overweight mama of three. There is no way I am ever getting on a racing bike in anything resembling lycra. I, however, have total bike love thanks to my Dutch bike. More and more the minivan remains parked and I get around by bike. Why sneer at that? > and I get around by bike. As it is, I have hardly been driving my car since we moved to the Boston area; I really don't enjoy it. But I don't particularly like the T either. So my Pashley will probably become my one and only transportation method. Since I wear almost exclusively skirts and dresses, this would not have been possible with a sportier bike. The next accessory needed for biycles - a cup holder on the handlebars. Not a bottle cage, a cup holder... Hmmm. You can get hip-flash holders for bicycles already. I just saw a photo on one of the other blogs, where a bike had an actual cupholder mounted to the handlebars... where was it! This is brilliant! I have a road bike, wear lycra and clip into my pedals but for fitness/sport not for commuting. I love both worlds. I am influencing more people by cycling in style then I ever did in lycra. A lot of the women that I've talked to are intimidated by road bikes and would never consider clipping in. But I've now convinced my mom to ride by purchasing a slightly used Trek low step model. She hasn't been on a bike in over 20 years when she fell. I like the quote that I saw on a Gary Fisher catalog.."Anybody who rides a bike is a friend of mine". I think this is a wise reflection on the north american biking community. In Europe, everday people cycle to get to work, school, etc. But here in North America it seems only to be the hardcores on expensive road or mountain bikes with panniers and all kinds of bike clothing who cycle. This scares everday people away from cycling. If more people just hopped on a bike without the gear, I think it would show that anyone can cycle! Good points! I remember the first time I saw a Gazelle. It was my first day biking in Europe and I didn't know enough about bicycles to understand why it enthralled me. I considered stopping the rider to ask what kind of bike it was. Then 15 minutes later I saw another one. And then another one. Then I saw a whole row outside a bike shop. Needless to say, ours wasn't a exclusive romance. Finally, bikes for the rest of us! I'm a great fan of the gazelle and other "dutch" bikes. The fashion part is just lucky. The reasons for my fandom are they are low maintenance, high in integreted features, strong enough to carry passengers, and have a riding position that means you don't need to wear spandex or even remove your belt to ride comfortably. Those who scorn the "sit up and beg" bike as they used to be called are themselves suffering from outdated values riding their road bikes, fixies, or all-terrain bikes. They are the ones missing lights, comfort, load-carrying, integral lock, closed mechanicals, mudguards etc. WHO is the fashion victim again? Honestly, these "Dutch Bikes" are actually quite practical machines. However, I prefer to go for vintage machines. For some reason old Raleigh DL-1 Roadsters and similar old bicycles actually weight a lot less than modern offerings. Perhaps the tinkerer in me makes me biased towards bicycles that need some love and attention, or the greenie in my prefers to recycle and buy second-hand. Just a reminder :) Dutch bikes are nothing "new". I ride a Jorg&Olif in Toronto and its identical to the bike my Oma (my actual grandmother, not a bicycle) used to ride everyday. Dutch bikes have not changed much over the past 100 years or so. Picture this: My Oma, 75 years old, cute white curly "sheep" hair, polyester dress from sears, her figure never having quite recovered from giving birth to 10 kids, wearing orthopedic shoes and riding a gazelle on city streets with a basket full of groceries and her tan pleather purse. I'm first generation Canadian but would never dream of riding a "sports" bike, ever. They just don't make any sense. Especially in the city. Andrea - Keep in mind that this post was written over a year before your comment. It is funny, because in March 2009, when I was looking for my first bike, they were very much new in my area and the concept was unknown to most bike shops. Now, in October 2010, everything has changed and they are a much more familiar phenomenon! I would like to chime in and note that those who say sit-up bicycles are somehow not real or that they are just making a fashion statement are practicing a fairly obvious form of hypocritical projection when it comes to everyday cycling. After all, what is a stripped-down hipster fixie if not a fashion statement? How about a lightweight carbon fiber bicycle with high-end components used for commuting? Or a wrapped-handle bend-over road bike ridden by someone in spandex with their very tight tush perched up in the air? I don't mean to denigrate any of these or a host of other personal fashion statement bicycle scenarios-- merely I'm trying to point out that everyone who rides a bicycle is doing so for a particular reason and with their own style. Performance is one, yes-- and hauling groceries on the way home from work while sharing the road with city traffic is another. A "real" bicycle in such circumstances, ridden by a person who is not particularly competitive or an athlete, is just as likely a sit-up-straight one with plenty of ways to carry cargo (including kids :-), sturdy gears and brakes, and good lights. It really has very little to do with how one dresses. If you like to dress up in your everyday life, and your bicycle is part of your everyday life, then you're likely to dress up when riding your bike. Skinny jeans, Pearl Izumi trunks, or a flared trench coat-- man or woman, it's all fashion. And if I like to wear a skirt (or perhaps a kilt) and prefer a step-through frame, it's just as "real" a bicycle as a diamond frame. Bicycle Diversity!